Bus transfers: Do you wish to travel from one place to another in Hessen? Do you need a bus transfer in downtown Hessen or from/to the airport? Or do you want to rent a coach with a driver to drive you to another city in Germany or in Europe? Whatever the case, Germany Bus is in connection with a large selection of bus rental companies whose experienced drivers will take care of your transfers. Sightseeing tours: Whether it is a tour in Frankfurt or in another city, a bus tour across the countryside or across other typical areas, with the help of Germany Bus you will be able to carry out any kind of tourist trail. For small groups to maximum 8 persons, we recommend renting a minibus with driver. 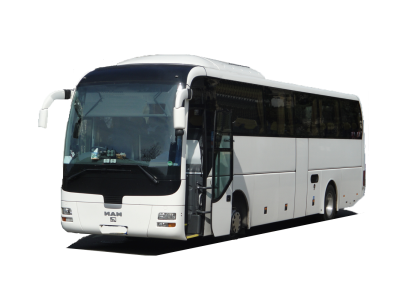 For bigger groups going on a long trip, it is best to choose small or large buses with driver. You may also require a local guide for your sightseeing tours in Hessen. Excursions by bus: As always for excursions in Hessen and its surroundings, we provide for a local and fully informed driver. Germany Bus makes available buses for half or full days excursions. Naturally, we will happily take part in the setting up of your excursions in Hessen. Travels by bus: Finally, we allow you to rent a bus with driver for any trip at any time and for as much time as necessary in Germany and Europe. Do you wish to travel to Berlin, Hamburg, Bremen, Italy, Poland or Austria? Quit searching and contact Germany Bus for a van or a coach with driver for your journeys in Europe. In the event that you need more help, the tour operator City Tours will gladly advise you and make reservations -booking a hotel, ordering food, booking tickets for events and attractions, hire a guide etc.-. Hessen Bus: this bus operator provides you with chauffeur-driven coaches in entire Hesse, including Frankfurt am Main, Wiesbaden, Kassel, Darmstadt, Offenbach, Hanau, Marburg, Gießen, Fulda, Wetzlar, Heppenheim and any other municipality in Hesse. No matter if you need a local coach, a long-distance coach or an emergency coach - you can order it here quickly and with ease. Frankfurt Bus: coach rental agency from Frankfurt am Main, proposing both local coach service for city sightseeing tours and transfers in Hesse and long-distance coach rental for bus travel all around Germany and in entire Europe. Fulda bus rental: charter a private bus with driver in Fulda for your transfers within the city, for sightseeing tours in Hesse and for national coach journeys in entire Germany. Wiesbaden Autobus: rent a bus in Wiesbaden for a private sightseeing tour or a business coach transfer. Hire coaches with driver for national and international bus trips in Germany and Europe. Charter coaches in Kassel: hire a comfortable, modern charter coach in Kassel for your bus transfers, bus tours and bus travel itineraries in Hesse, in other German regions and in entire Europe. Bus reservation in Darmstadt: request a quotation for your Darmstadt charter bus with this bus operator from Hesse. Rent a coach for an airport transfer, a city sightseeing tour or a bus travel itinerary in Germany. Rent a coach in Marburg: hire a comfortable bus including a conductor in Marburg an der Lahn and use it for a short transfer, a local sightseeing tour, a regional journey or an international long-distance tour in Germany, France or other countries of Europe.
. Germany Bus will be happy to forward you the most suitable offer in the shortest time possible. The estimate will take into account your simplest requests for a pleasant trip in Hessen!